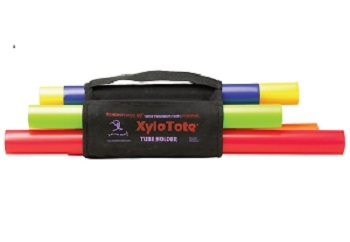 Our Xylo Tube Holder holds the Boomwhackers Tuned Percussion Tubes so they can be played like a xylophone, and then it rolls up to tote them wherever you like. The Holder holds up to 8 tubes---perfect for the popular C Major Diatonic Scale set. It also has a pouch for a Wack-a-Doodle-Doo Songbook and loops to stow our Boomwhacker Whacker Mallets.